This was a christening with echoes of the past and some distinctly Cambridge touches. The baptismal font and the replica christening gown have served other baby royals well in the past. Even the pram was a hand-me-down from the Queen. But when it came to godparents there wasn't a monarch, or a knight or a dowager in sight. Once such people provided infant Windsors with their spiritual guidance. Now, William and Kate have turned to their close friends and their close family to fulfil this role. William's mother, Diana, may have been absent, but she wasn't forgotten. One of her relatives is a godmother and the chosen church was where she too was baptised. This was the first time William, Kate, George and Charlotte have been seen together. Such sightings won't become commonplace. 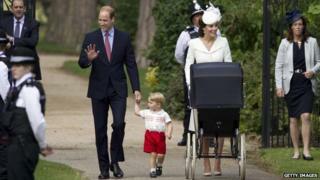 The Cambridges are keen to limit their children's public appearances as they grow up.